Nearly every town’s got a ghost story. 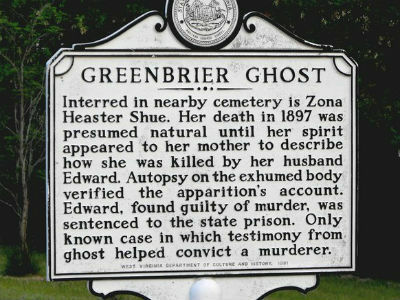 Far more rare is when a ghost story can be traced back to one specific, legally documented criminal case. Still, they do exist, and the stories they spawn are even scarier with real-life context. Here are five horrifying murders that created five spooky legends. Say what now? 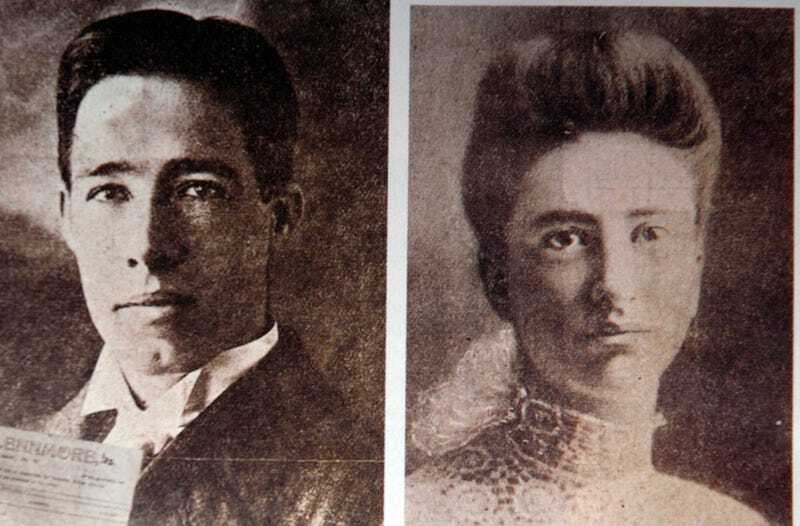 It seems in 1896, 23-year-old Zona Heaster swiftly fell for an older man: the new-in-town blacksmith, Edward Shue (full name: Erasmus Stribbling Trout Shue, though he went by “Edward” and some called him “Trout.”) He’d been married twice before (and his second wife had died mysteriously), but Zona was smitten and ignored the warnings of her mother, who’d been overprotective since Zona gave birth to another man’s out-of-wedlock baby the year before. She was stretched out, with her feet together and one hand on her abdomen and the other lying next to her. Her head was turned slightly to one side. Her eyes were wide open and staring. Even to this small boy, Zona Shue was obviously dead. [The young neighbor], not surprisingly, ran home to tell his mother. The local doctor and coroner, Dr. George W. Knapp, was summoned to the house, although he didn’t arrive for nearly an hour. By this time, Shue had carried his wife’s body upstairs and had laid her out on the bed. Contrary to local custom, he dressed the corpse himself. Normally, it was the proper thing for ladies of the community to wash and dress a body in preparation for burial. However, Shue took it upon himself to dress Zona in her best clothing. A high-necked, stiff-collared dress covered her neck and a veil had been placed over her face. While Dr. Knapp examined her and tried to determine a cause of death, Shue stayed by his wife’s side, cradling her head and sobbing. Because of Shue’s obvious grief, Knapp gave the body only a cursory examination, although he did notice some bruising on her neck. Edward Shue prevented any closer examination of the body, and Zona’s death was chalked up to “childbirth”—though nobody seems to know if she was even pregnant at the time of her death. She was swiftly buried wearing a high-necked dress and a scarf provided by her insistent but apparently grieving husband, who also took care to prop up his dead wife’s head using a rolled-up sheet. About four weeks after her daughter’s death Mary Jane began having visions. Four nights in a row, Zona’s ghost came to her and told her that Trout had abused her. The ghost told Mary Jane how she and Trout had argued the day of her death. She said that Trout attacked her and broke her neck. As the ghost was leaving, she turned her head around until it was completely facing backward. The Greenbrier Independent reported that his “testimony, manner, and so forth, made an unfavorable impression on the spectators.” The jury deliberated for just an hour and ten minutes before returning a guilty verdict. The “testimony” of a ghost was enough of an oddity to spare Shue the death penalty, but he did get life in prison; he died just three years later while serving his sentence. Wilcox was tried twice for Cropsey’s murder. The first guilty conviction was overturned when the NC Supreme Court declared a mistrial. A second trial convicted Wilcox on a charge of second degree murder and sentenced him to thirty years in prison. At neither trial did Wilcox take the stand in his own defense. Wilcox was pardoned by Governor Thomas Bickett in 1920. To the end of his life, Wilcox maintained his innocence. Shortly before his death in 1932, Wilcox spoke with W.O. Saunders, the editor of the Elizabeth City newspaper, and revealed everything he knew about the murder. But before anything could be published, Saunders died in a car wreck, and Wilcox shot himself. Local legend says Nell Cropsey still haunts her former Elizabeth City home, perhaps trying to convey the truth about her mysterious death. Strange occurrences and even sightings of her ghost have been reported by subsequent occupants of the sweeping Victorian, still a private residence. Grace Brown’s 1906 murder was memorialized in Theodore Dreiser’s An American Tragedy, which provided the basis for the 1951 film A Place in the Sun. And it’s no surprise why, as the tale is as heart-wrenching as they come. Her killer, Chester Gillette, was the son of the man who owned the factory where Grace worked. He was also her boyfriend, and the father of her unborn child, though he wasn’t planning on staying in either of those roles any longer than he had to. Grace, of course, had no idea of his sinister plans. On July 11, 1906, Miss Brown, 20, climbed into a boat with her boyfriend, Chester Gillette. They rowed onto Big Moose Lake in the Adirondacks, where Mr. Gillette bludgeoned Miss Brown with a tennis racket and pushed her overboard, knowing she could not swim. After her bruised body was plucked from the water the next day, an autopsy showed she was several months pregnant. The police also found her desperate letters to Mr. Gillette, 23, saying she knew he was dating other women, and was terrified he would run off. Mr. Gillette’s trial in the village of Herkimer, the county seat, was the biggest this region had ever known, drawing reporters from around the country and making front-page news. He was found guilty and executed in 1908, but the crime continues to fascinate murder-mystery buffs, and its facts remain the subject of much discussion. And over the years since the tragedy, there have been reports of Grace’s ghost haunting the shores of Big Moose Lake. Historic home Cherry Hill is an Albany, New York landmark; it was built in 1787 and was occupied by the same family for generations until it was turned it into a museum in 1964. Visitors can take tours based on the home’s architecture as well as its ongoing restoration efforts... and the occasional “Murder at Cherry Hill” tour. A rifle shot, a scream and the Cherry Hill household erupts in chaos! On May 7, 1827, a notorious murder occurred at Cherry Hill that resulted in two sensational trials and Albany’s last public hanging. Join us to investigate the scene of the crime and the differing perspectives of those who were there on that fateful evening. But there’s a lot more to the story, including a ghost. The trouble began when a worker at Cherry Hill named Joseph Orton (his real name, it later came out, was Jesse Strang; he’d changed it after faking his own death in 1825 as part of a scheme to desert his wife and four children) fell for one of the “upstairs” ladies who lived in the well-populated house. Elsie Whipple was related by marriage to the man who’d originally built Cherry Hill; she herself had gotten married at the tender age of 14, and her husband John had turned her inheritance into a growing fortune. But that didn’t stop Elsie from reciprocating Jesse’s forbidden feelings, and the two began exchanging steamy love letters. The only way they could be together, they decided, was to do away with John Whipple. That would free Elsie from her marriage—and free her money, too. They concocted a scheme that included false sightings of strange men lurking around the property, culminating in John’s death on May 7 (Jesse shot him through one of Cherry Hill’s windows; the bullet hole is still there). In June Jesse Strang confessed to the murder and told prosecutors where to find the rifle. He believed that if Elsie was convicted as well, her powerful family connections would get them both pardoned and he tried to lay the blame on her. But when his lawyer and the prosecutor told him that nothing he said against Elsie would lighten his punishment he withdrew his confession. It didn’t matter. He was found guilty of first-degree murder. In a separate trial, Elsie—the Albany blue-blood—was acquitted of the same crime. Ill-gotten family wealth in hand, she soon remarried and left town. So what about the ghost? Some say it represents murder victim John Whipple (“those who have encountered him do say they sense an anger surrounding the spirit”), while others say it has to be the hapless killer, Jesse Strang. [Christine Darby’s] abduction two years earlier [in 1967] followed the disappearance of two other girls - Margaret Reynolds, six, from Birmingham, and Diane Tift, five, from Bloxwich, West Midlands. All three had been abducted, raped and murdered before being buried on the Cannock Chase Area of Outstanding Natural Beauty. Morris died in prison in 2014 when he was 84 years old. But some believe his tiny victims continue to haunt the place where he made their graves, and that their ghosts have terrifying blacked-out eyes. The Black-Eyed Child was (allegedly) spotted in Cannock Chase for the first time in three decades around the time of Morris’ death, which may or may not be coincidental. As the Birmingham Mail reported in 2014, this particular type of ghost has gained a cult following in tabloids and on the internet (read the Snopes entry on the phenomenon here, and the Creepypasta story page here), and has certainly influenced more than a few horror movies.